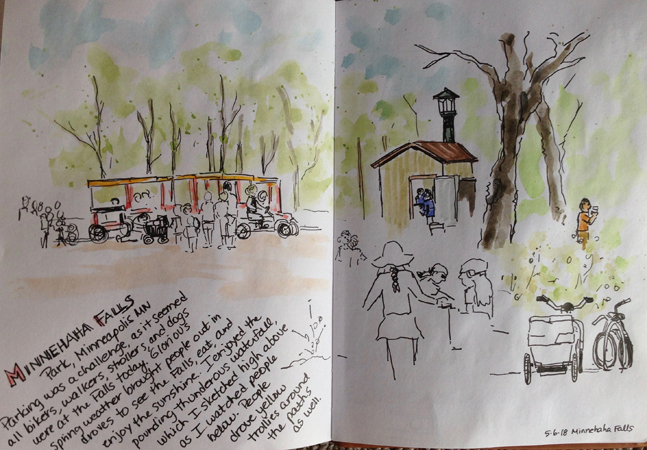 Yesterday was a glorious day to be sketching at Minnehaha Falls in Minneapolis. Parking was scarce, it seemed all of the Twin Cities were out at this extensive park biking, running, walking, pedaling trollies, and hanging out. I had a long walk to the falls themselves and enjoyed the budding trees as I sauntered along. I sketched the falls first, from the eyrie at ground level, as the water pounded and thundered in front of me and crashed on the rocks below. It is great to have this waterfall right in urban areas, and it is spectacular! I didn’t venture down the steps to view it from below, but I saw tiny people below in the distance. I found the group of sketchers hanging out in the shade by the Sea Salt restaurant, so I joined them. I sketched the piece above, as I watch bikers and people lined up for the pedal trollies. The place was packed, people were wandering around everywhere. After a bit, the sun was getting to me, so I packed up to walk back to my car. I stopped at the John H. Stevens house, the first settler in Minneapolis. I liked his statue, so decided to sketch it, the house, and the little outhouse in the corner. All in all, it was a relaxing, warm afternoon, and I enjoyed it very much!